DIORH is a trusted advisor to large private companies and institutions. We help top executives leverage their HR assets to be in line with their vision, values objective. 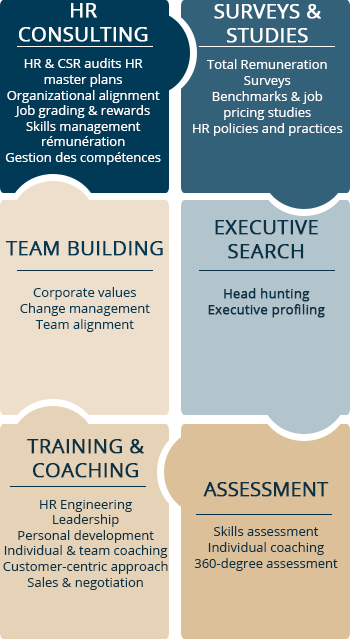 Since 1993, we have developed methodologies and quantitative models that enable us to provide our clients with extensive expertise in HR process engineering, HR assessment, and development. Our integrated value proposition is based on applying our specific methods and expert knowledge in each area of Consulting, Executive Search, and Development. Through collaboration, excellence and, innovation, we strive to be a catalyst of collective intelligence and to create the impact and the added value that our clients seek.